We asked our jumpers what their favorite skydiving movie is and compiled this list for your pre-jump movie marathon. Read on and get hyped about freefaling in the sky! You’ll notice that Point Break, a movie with some of the most famous jump scenes, is missing from this list. It is this author’s personal opinion that we should give other movies a chance for once! Here is our (un)official list of the best skydiving movies in chronological order. Gypsy Moths is a classic amongst the skydiving world. It is an important look into the early years of the sport - its culture, equipment, and videography. Gypsy Moths follows a skydiving team of the same name as they travel to a small town to do their next show. Although more dramatic than real life, this movie shows the beauty and depth of the pioneers of our great sport. Innovation. Not only does Gypsy Moths focus on a stunt using “bat wings”, the precursor to the modern wingsuit, it is chock full of early freefall videography. Freefall cameraman for the film, Carl Boenish, was a leading freefall cinematographer and base jumping pioneer. While filming, Boenish took groundbreaking freefall shots with a 35-millimeter camera strapped to his helmet. There is a critically acclaimed documentary, Sunshine Superman, about the life and accomplishments of Boenish, including the work he did to make the shots in Gypsy Moths possible. Set in 1971, Fandango is a funny, silly, sentimental and serious take on the end of college and what it meant to be drafted in the war. Four friends ending college and facing the end of their draft deferment into the Vietnam War decide to have one last hoorah by taking a final road trip. Unlike the other films on this list, Fandango’s plot is not focused on skydiving, but has a pretty amazing, and terrifying, side adventure into the sport. 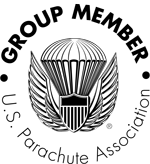 When they come across a rundown skydiving school, the group peer pressures one of their friends to take the course. What follows is the best ground school scene ever filmed. The student, Phil, jumps with a laundry bag instead of a skydiving rig. It has the most comical and somewhat accurate ground school you will ever see! Young Kevin Costner. That’s all you need. This is around the time that cheesy, action-filled skydiving-focused movies hit the big screen, including Point Break (1991) and Terminal Velocity (1994.) Drop Zone, starring Wesley Snipes follows the typical plot line of this genre in the 90’s: drugs, federal agents, and outlaw skydivers. Although similar, Drop Zone is usually the clear winner amongst skydivers between the early 90’s skydiving films. This is largely due to the original stories of the creators, who were experienced skydivers. This includes Guy Manos, who pops up later on this list. The creators were focused on taking the action genre of the day and infusing it with true skydiving culture. The opening scene on a commercial airline that involves cats, mysteriously placed guns, and an impossible escape. It is 100% worth the watch. For once in a movie of this type, skydivers are not portrayed as criminals, and instead they save the day. Snipes' character's last name is Nissep, an anagram of Snipes. Anagrams are cool. We continue down the 90’s skydiving film path of agents, drugs and renegade jumpers. This incredibly cheesy made-for-TV movie features an absurd B list cast, including Steve Baldwin, Dennis Rodman, and Tom Barringer, and is the continuation of Guy Manos’ Hollywood career. It has all of the fun and absurdity of Drop Zone, but with Manos in the director's seat, it has even better and more realistic skydiving scenes, and a deeper view of dropzone culture. There are a ton of wonderfully absurd scenes, but my personal favorite is the one where a skydiver clipped a tent while landing, revealing 2 naked people and a cameraman. If you want to know about skydiving culture, this is about this closest thing you’ll get in Hollywood. It features skydiving rituals like getting pied in the face, the nightlife antics of skydivers, skydivers from all walks of life, and skydiving lingo. It has a cameo by the skydiving equipment inventor, Bill Booth. If you have jumped before, you have probably already seen him. If you haven’t, you will see him in your introduction video - he is the guy with the crazy long beard! Alright, so this is a magical movie set in a magical land in another time, with no real skydiving. However, it continues the story of Hiccup, the young Viking who rides around on his best friend, Toothless, who happens to be a dragon. In the second film, hiccup introduces his own wingsuit-like creations to help him jump off his scaly friend and soar through the sky. To make the animation as real as possible, head of Character effects, Oliver Finkelde, decided to learn how to skydive in order to create the best and most realistic visual effects. Eventually, Finkelde got his license and progressed to flying wingsuits in order to fully understand the physics involved in the discipline. Nothing. Who doesn’t like dragons? If you want to get inspired to soar through the air, but aren’t a fan of explosive action movies, this is the film for you. Get your popcorn ready, cue up your movies and book your first skydive!